Lubos Kaluda, Pat O’Sullivan (Limerick FC Chairman), Dawid Janczyk, 12/02/2012 Limerick FC are delighted to announce the arrival of two CSKA Moscow players to Ireland for trials with Limerick FC. 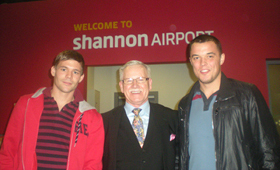 The players were welcomed at Shannon Airport on Sunday evening by Pat O’Sullivan, Chairman. Both are expected to play some part of the game with Sligo Rovers at Terryland Park, Galway, on Monday 13 February (kick-off 7:45pm) and to train with the team on Wednesday. Lubos Kaluda (on the left) is a 24-year-old Czech International midfielder and has been with CSKA Moscow since 2008. Dawid Janczyk (on the right) is a 24-year-old Polish International striker who has been with CSKA Moscow since 2007. Both players were on loan last season to PFC Oleksandriya (Ukraine).